Cherry Pool is an amazing lake. At under an acre it is the smallest and the deepest of the lakes across Cherry Lakes complex with depths going down to some 17 feet. It is a terrific mixed fishery which contains some great fish and real specimens. It has an amazing number of fish and is heavily stocked. 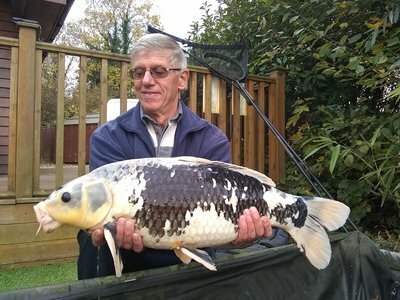 It has much to offer every type of coarse angler from fantastic Roach and Rudd to 3lb; Crucian Carp and Perch to 4lb; Bream to 8lb as well as Carp to mid 20's. It also has a good stock of Ghost Carp including some Koi Carp. In short you never really know what will take your bait next. The surrounds of Cherry Pool contain a wonderful array of plants, Norfolk Reeds and Yellow Flagged Irises, as well as a wide variety of trees from Willows and Alders to Yews and Wellingtonia. All of which are a pleasure on the eye. 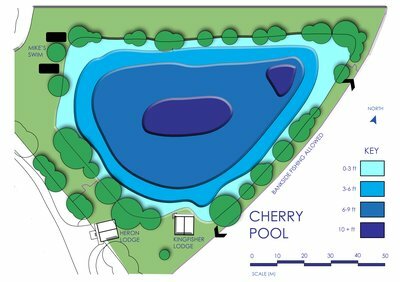 Cherry Pool is available exclusively to anglers who have booked Egret Lodge. The large artificial grass fishing platform which is situated less than 8 feet from the entrance to the Lodge is ideally positioned to allow guests to fish all areas of the lake. It also neatly divides the lake into two. So if there are two of you fishing there is no need to argue! The fishing platform is very comfortable and clean to fish from. .Cherry Pool is heavily stocked with Carp. The majority of these Carp are between 8-15lb. 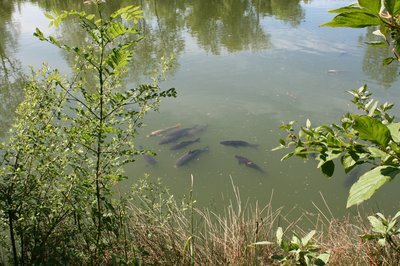 The sheer number of fish within Cherry Pool prevents the Carp from growing to the sizes in the other lakes. There are a small number of Carp over 20lb, most of which are Commons. the lake record stands at 28lb which was caught in 2014. Amazingly the lake contains several very large Koi Carp. to around 20lb. Given the stock and competition amongst the fish in the lake, Cherry Pool is our easiest lake fishing wise and the most consistently productive in the winter. Cherry Pool responds well to all fishing methods. Float and pole fishing can be undertaken straight off the front of the fishing deck. The water is 6 foot deep one rod length out and closer to 12 feet just two rod lengths out. Past anglers tell me the depth is important. 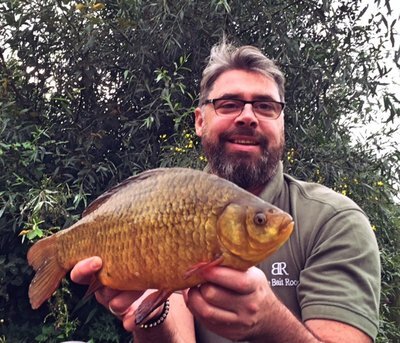 Sometimes the Crucian Carp will be the only fish feeding at depths of 8 feet. Yet at depths of 10 feet all they can catch is Bream or Roach etc. Feeder and method fishing can turn up just about anything and can be real fun. 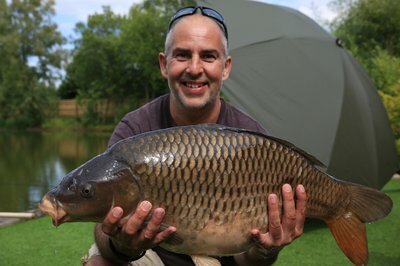 Carp fishing traditional style tends to be most productive by targeting the margins around the lake with depths of 4-8 feet normally being the best. If you are Carp fishing the minimum line strength is 15lb. If however you are targeting other species lighter lines are permitted. At all times hooks are to be barbless and fish safety is paramount. As well as the normal Carp Cradle, Weigh Sling and 42″ Carp Landing net, we also provide a 20″ pan telescopic Landing net for those anglers targeting the Bream, Roach and Perch. So no need to bring any nets or unhooking mats. As most of your fishing is likely to be from the Lodge platform you will need your rod pod. Fish care and safety is paramount across Cherry Lakes. An approach welcomed by all good anglers who want to catch high quality good conditioned Carp. All anglers are expected to follow any advice or requests from the fishery management concerning fish safety. Cherry Pool guests are uniquely able to park their cars in the area behind the Lodge. A real advantage if you are bringing lots of tackle! Other guests using the Cherry Lake Lodges have to return their cars to the car park after unloading.